Many of the thousands of children separated from their parents at the southern U.S. border under the Trump administration’s paused zero-tolerance policy went to one of Texas’ 32 state-licensed facilities. 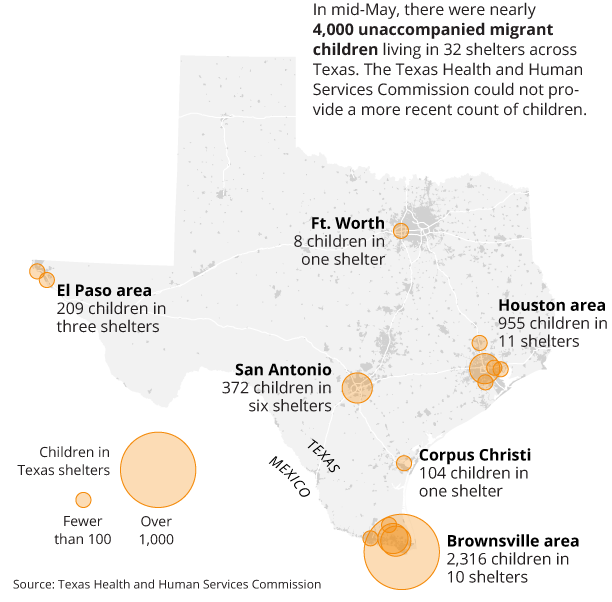 Those shelters, licensed as child care providers that may accept unaccompanied minors as well as children taken from their families, have a long history of regulatory inspections that have uncovered serious health and safety deficiencies. The facilities are required to provide basic care to children of detained migrants, including medical care and at least six hours of daily schooling. Their inspection reports, though often light on details, paint a picture of abuses young children may face in a foreign environment, where many face language barriers and a history of trauma from the journey to the United States. Counts of children on this page are current as of May, according to the Texas Health and Human Services Commission. Inspectors found 246 violations at the group’s 16 facilities in the last three years, records show. On October 11, 2017, at a Southwest Key facility in San Benito, an employee appeared drunk when he showed up to work. A drug test later found the employee was over the legal alcohol limit to drive. Inspectors also found shampoo dispensers filled with hand sanitizer and bananas that had turned black. In two instances, children were made to wait before receiving medical care: three days for a child with a broken wrist and two weeks for a child with a sexually transmitted disease. A spokeswoman for Southwest Key did not return phone calls or an email seeking comment. BCFS Health and Human Services is the second-largest contractor operating in Texas. The group operates six facilities that may accept migrant children. It was founded in 1944, according to its website. At another BCFS facility in San Antonio, a staff member last April helped arrange for a child’s family member to send money for the child — but when the cash arrived, the staff member kept it. The year before, an employee gave children “inappropriate magazine pages” that depicted naked women, while a few months before, staff members were found to have failed to supervise their wards closely enough to prevent one child from “inappropriately” touching two others. Reached by phone, a receptionist for BCFS Health and Human Services said she had been told to direct reporters’ questions to federal officials at the Administration for Children and Families. Upbring operates two facilities that accept unaccompanied minors and children separated from their parents by immigration authorities. The company was previously known as Lutheran Social Services of the South. It rebranded itself after implementing better protocols following the 2013 death of a 1-year-old girl at one of its foster homes. Five other groups are licensed to operate child care facilities for unaccompanied minors in Texas, though they receive comparatively little federal funding to do so. Those groups are Catholic Charities, St. Peter. St. Joseph Children’s Home, Shiloh Treatment Center, Seton Home and The Children’s Center. The Shiloh Treatment Center was first incorporated in 1995, according to the Houston Chronicle. It first began receiving federal funding to house migrant children in 2013. It has been dogged by allegations of abuse following the 2001 death of Stephanie Duffield, 16, at the center after she was restrained by staff, but the center has been found to be in compliance with state requirements. Shiloh did not respond to a request for comment. The Children’s Center, based in Galveston, does not currently accept federal funds to care for unaccompanied minors, but it is licensed to serve up to 72 children, according to state regulators.